Thematic data (also known as discrete) represents features such as land-use or soils data. Continuous data represents phenomena such as temperature, elevation, or spectral data such as satellite images and aerial photographs. Pictures include scanned maps or drawings and building photographs. A common use of raster data in a GIS is as a background display for other feature layers. For example, orthophotographs displayed underneath other layers provide the map user with confidence that map layers are spatially aligned and represent real objects, as well as additional information. Three main sources of raster basemaps are orthophotos from aerial photography, satellite imagery, and scanned maps. Below is a raster used as a basemap for road data. Rasters are well suited for representing data that changes continuously across a landscape (surface). They provide an effective method of storing the continuity as a surface. They also provide a regularly spaced representation of surfaces. Elevation values measured from the earth's surface are the most common application of surface maps, but other values, such as rainfall, temperature, concentration, and population density, can also define surfaces that can be spatially analyzed. The raster below displays elevation—using green to show lower elevation and red, pink, and white cells to show higher elevations. Rasters representing thematic data can be derived from analyzing other data. A common analysis application is classifying a satellite image by land-cover categories. Basically, this activity groups the values of multispectral data into classes (such as vegetation type) and assigns a categorical value. Thematic maps can also result from geoprocessing operations that combine data from various sources, such as vector, raster, and terrain data. For example, you can process data through a geoprocessing model to create a raster dataset that maps suitability for a specific activity. Below is an example of a classified raster dataset showing land use. Rasters used as attributes of a feature may be digital photographs, scanned documents, or scanned drawings related to a geographic object or location. A parcel layer may have scanned legal documents identifying the latest transaction for that parcel, or a layer representing cave openings may have pictures of the actual cave openings associated with the point features. Below is a digital picture of a large, old tree that could be used as an attribute to a landscape layer that a city may maintain. Sometimes you don't have the choice of storing your data as a raster; for example, imagery is only available as a raster. However, there are many other features (such as points) and measurements (such as rainfall) that could be stored as either a raster or a feature (vector) data type. Raster datasets are potentially very large. Resolution increases as the size of the cell decreases; however, normally cost also increases in both disk space and processing speeds. For a given area, changing cells to one-half the current size requires as much as four times the storage space, depending on the type of data and storage techniques used. Cell values can be either positive or negative, integer, or floating point. Integer values are best used to represent categorical (discrete) data and floating-point values to represent continuous surfaces. For additional information on discrete and continuous data, see Discrete and continuous data. Cells can also have a NoData value to represent the absence of data. For information on NoData, see NoData in raster datasets. Rasters are stored as an ordered list of cell values, for example, 80, 74, 62, 45, 45, 34, and so on. The area (or surface) represented by each cell consists of the same width and height and is an equal portion of the entire surface represented by the raster. For example, a raster representing elevation (that is, digital elevation model) may cover an area of 100 square kilometers. If there were 100 cells in this raster, each cell would represent 1 square kilometer of equal width and height (that is, 1 km x 1 km). The dimension of the cells can be as large or as small as needed to represent the surface conveyed by the raster dataset and the features within the surface, such as a square kilometer, square foot, or even square centimeter. The cell size determines how coarse or fine the patterns or features in the raster will appear. The smaller the cell size, the smoother or more detailed the raster will be. However, the greater the number of cells, the longer it will take to process, and it will increase the demand for storage space. If a cell size is too large, information may be lost or subtle patterns may be obscured. For example, if the cell size is larger than the width of a road, the road may not exist within the raster dataset. In the diagram below, you can see how this simple polygon feature will be represented by a raster dataset at various cell sizes. 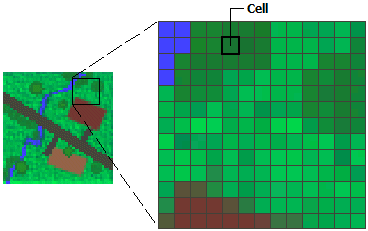 The location of each cell is defined by the row or column where it is located within the raster matrix. Essentially, the matrix is represented by a Cartesian coordinate system, in which the rows of the matrix are parallel to the x-axis and the columns to the y-axis of the Cartesian plane. Row and column values begin with 0. In the example below, if the raster is in a Universal Transverse Mercator (UTM) projected coordinate system and has a cell size of 100, the cell location at 5,1 would be 300,500 East, 5,900,600 North.